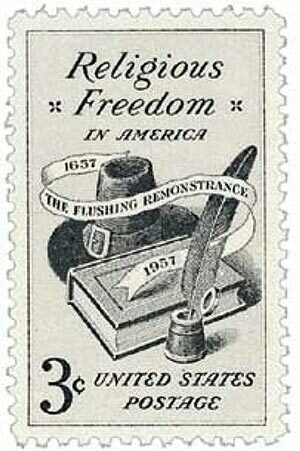 U.S. #1099 – Religious Freedom issue. Held in 1742, the conference hosted 24 German clergymen, including Henry Muhlenberg. However, tensions were high between the pious and orthodox sects both in America and abroad. The creators of this conference intentionally excluded orthodox representatives, who in turn disrupted the meeting. No progress was made at this time. Five years later, Henry Muhlenberg requested that another conference be held in Philadelphia. Members from both sects were invited this time and on August 26, 1748, they met and agreed to work together as the “Ministerium of North America.” They established a common liturgy to be used in all American Lutheran churches. This meeting is often considered the most important event in North American Lutheranism. The Ministerium operated informally until a constitution was established in 1781. Known as the German Evangelical Lutheran Ministerium of North America, its members spanned much of the colonies – from New York down to the Carolinas. 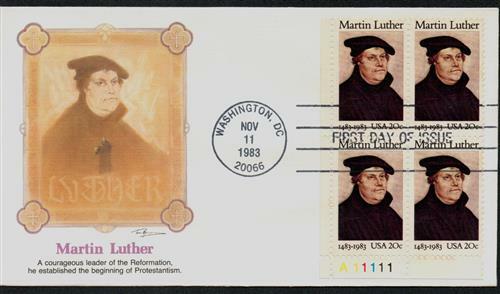 U.S. #2065 – Martin Luther Silk Cachet Combination First Day Cover. Over time, Lutheran congregations formed similar ministeriums, so the name was changed to The Ministerium of Pennsylvania and Adjacent States. Throughout the 1900s, the various congregations were unified several times. The most recent of these is the Evangelical Lutheran Church of America, which was established in 1988. 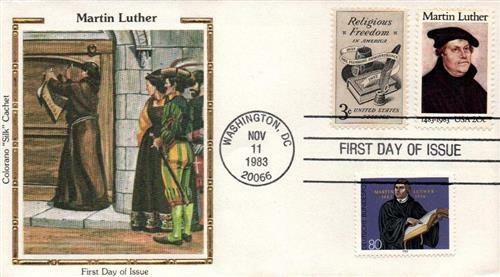 U.S. #2065 – Martin Luther Plate Block First Day Cover. 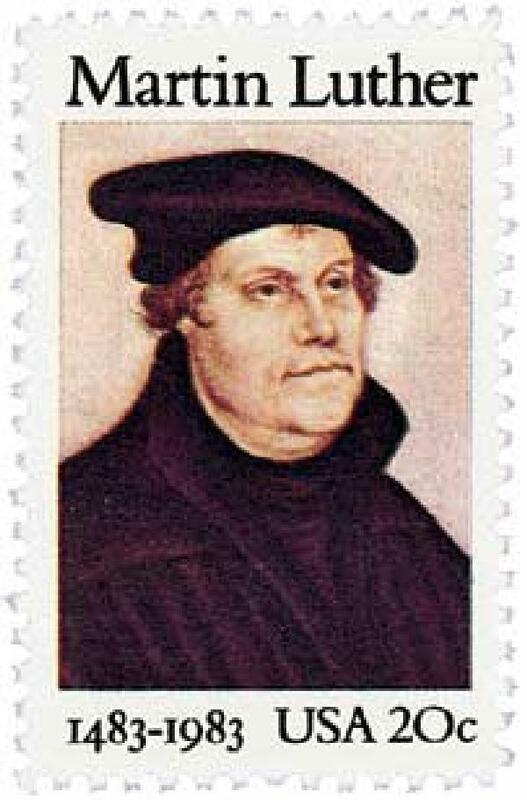 3 Responses to "This Day in History… August 26, 1748"
It may be worth pointing out that Martin Luther had no desire to form a new church. What he wanted was reform of the church that existed. Very interesting. Thanks for sharing, Arline! It is important to many protestant churches that this year is the 500th Anniversary of the Protestant Refrormation and will be celebrating such a hallmark event especially in October. It will feature Martin Luther and other well-known Reformers of that time too, i.e.. John Calvin, John Knox and Ulrich Zwingli.